Topaz Tribal love to dance to spread the joy, the power & the passion of this dance, to have fun, to laugh, to share and just enjoy the moment of dancing with your sisters. 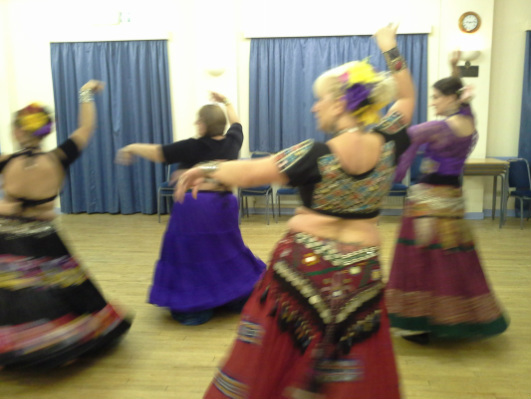 Topaz Tribal are a group of like-minded women who love to get together, to dance, share, laugh, support and there for each other because we can. Topaz Tribal remain true to the Gypsy Caravan Tribal Bellydance® format, incorporating their own style of 'gypsy' in their costumes, by layering 25yard+ (around the hem) skirts, over an underskirt or petticoat and layers of frothy lace on wide leg pants or big 4 yard, voluminous pantaloons in their bright and colourful costuming. We meet on a Tuesday evening to drill, practice, develop, learn and share. Following the GC format, we dance, using both sides of the body, that may sound strange, but it means we use the left and right hips/feet to lead the move or combination. It causes much mayhem and laughter whilst learning and drilling, sometimes your brain refuses to acknowledge that your body has a left side. But that's good, because it makes you think.... about what you're doing, how you're doing it, & why....... weight placement, your centre core - all comes into play. It helps you build confidence in yourself and your fellow dancers, you learn to trust your instincts and those of others. And then we dance in a circle, to include a soloist, duets, trios, we can dance in a chorus, but we dance for the sheer joy of it, we dance for each other, and most importantly we dance for ourselves.